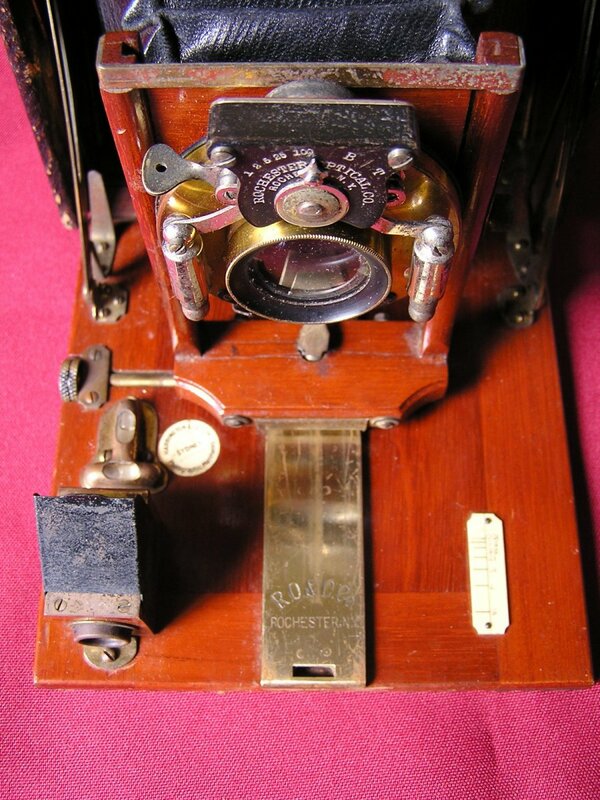 This is a Pony Premo Half Plate Camera, made circa 1905 by the Rochester Optical Company in the USA. 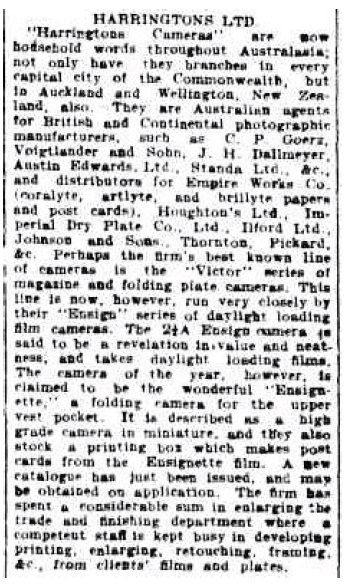 The Rochester Optical Company and the Camera Company operated from 1899 to 1903. 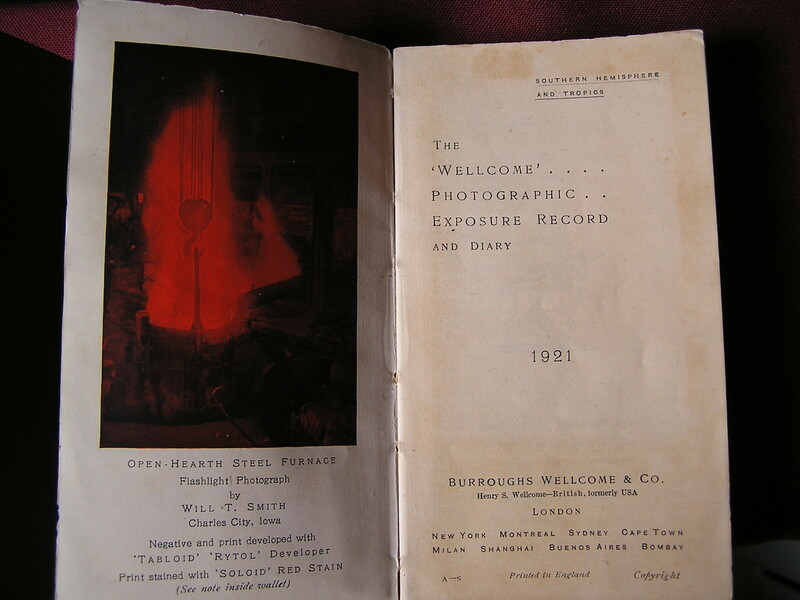 In 1907 it was acquired by by Kodak, the company that went on to dominate photography for nearly a century. In 2012 Kodak filed for bankruptcy. 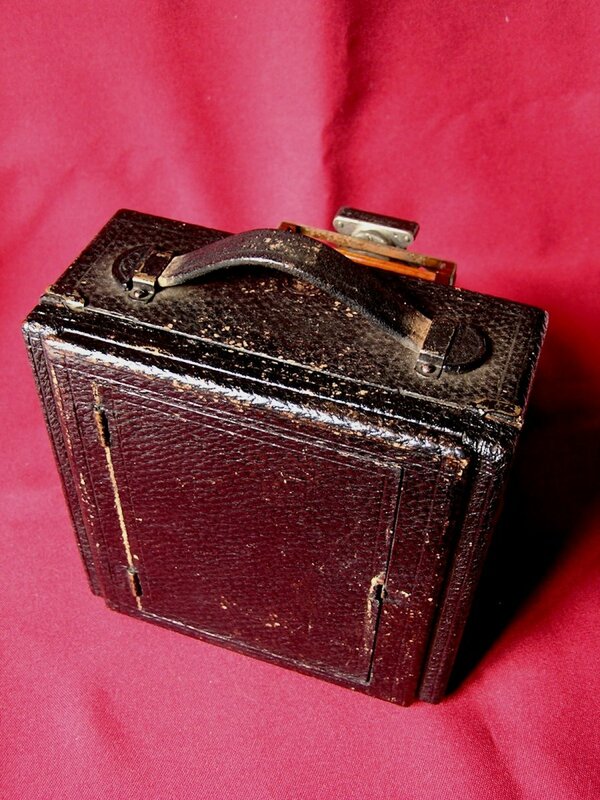 The camera has a mahogany frame with leather covers and folding bellows. Inside the leather covering are three double plate holders that can hold ‘half-plates’, 4’’x5’’, and the camera can be set with different aperture settings and exposure times. (Aperture settings f/ : 8, 16, 32, 64, 128. Exposure times 1, 1/2, 1/5, 1/25, 1/100 sec.). The front lens can be moved up and down to correct perspective. This correction allows the user to avoid ‘keystoning’ effects, a distortion of the image that makes a square look like a trapezoid. Photographic plates were invented in the early 19th century and were used as a capture medium in photography before photographic film, which is used today. The plates were made of thin glass that was coated with light-sensitive emulsion of silver salts. 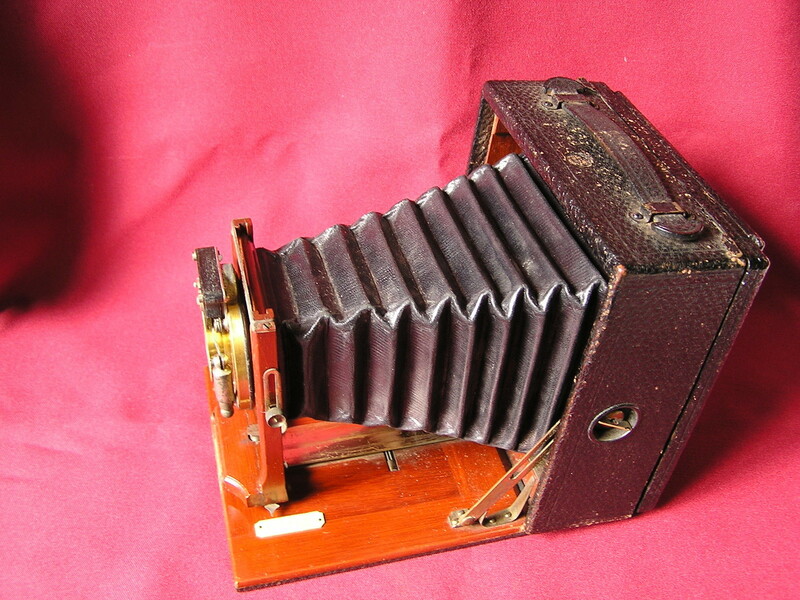 The first light sensitive plates were developed by Joseph Niépce in 1826 and needed to be exposed to light for 8 hours. In the early 20th century more convenient and less fragile films became popular. 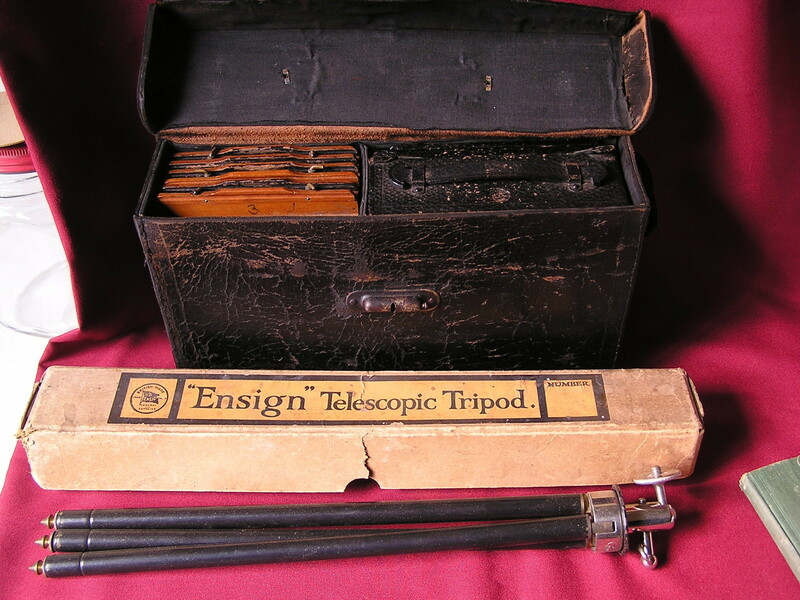 However, glass plates were still in wide use throughout the professional astronomical community until the 1990s as they were extremely stable and less likely to bend or distort when used in wide-field imaging. Today, glass plates are still used in some forms of laser holography. Early photographic emulsions were not sensitive to red light. Later ‘panchromatic’ emulsions were sensitive to red light but the image did not distinguish between colours. Lippmann was awarded a Nobel Prize for a colour recording system we might now call holographic, however it did not catch on. Eventually complex systems using three emulsions and layers of colored filters on film were perfected and widely used. Film photography was made obsolete by the introduction of digital photography in the early 1990s.